Assume 1000 customers purchased various amounts of products from a business. Cost to serve and revenue from sales vary per customer based on normal distributions controlled by mean and sigma. Each customer contributes an incremental amount of profit equal to the difference of revenue and cost. 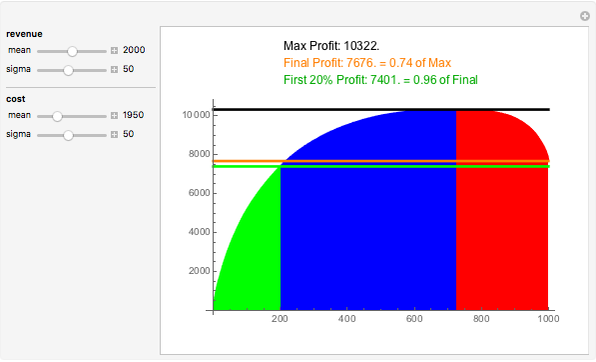 The whale curve shows cumulative profit sorted by most profitable customer first. The most profitable customers are on the left; the first 20% are shown in green. The next segment of customers, who are still profitable, is shown in blue. The least profitable customers on the right may lose the business money; if so they are shown in red. Modifying the mean or sigma of revenue and cost changes the shape of the whale curve. With small sigmas and revenue greater than cost, the shape is similar to a Pareto curve. In most cases the 20% most profitable customers achieve a large percentage of the final profit. 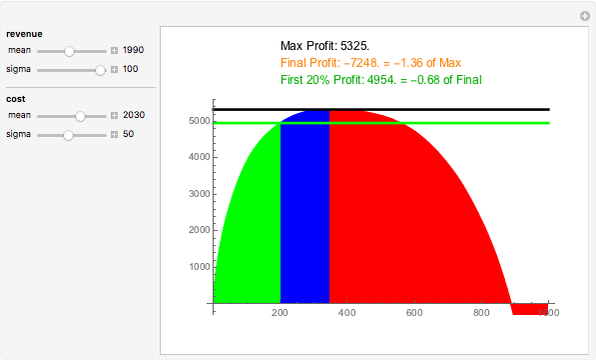 Sometimes the least profitable customers (in red) lose a large percentage of the maximum profit achievable without the money-losing customers. For business analysis, it helps to focus on both the green and red segments (to maximize profits and avoid losses). Thomas Laussermair "Customer Profitability with the Whale Curve"